All M2M amplifiers and repeaters listed below are compatible with your Wind Mobile service. Wind Mobile M2M Signal Boosters for use in ATMs, lotto & vending machines, remote monitoring systems, etc. weBoost 4G kits help take advantage of more speed and more power of the faster and stronger Wind Mobile 4G, 5G, LTE+ or LTE Advanced networks to download and upload wireless data as fast as your cellular modem and Wind Mobile is capable of providing. Wind Mobile is the fourth largest wireless carrier in Canada. It has close to a million subscribers and has a significant presence in M2M operations. While the company is known more as a mobile network operator, its 4G HSPA+ network coverage is growing and more companies are relying on it for their M2M operations. Personal devices like smart phones and tablets face network issues but they do not have as much of a consequence as in case of machines that depend entirely on the network to function or to cater to its objectives. Excluding emergencies in case of personal use, weaker signals can cause intermittent issues which are bearable but it is imperative to have strong signals at all times for cash dispensers, vending machines and security systems among others that rely on a network. If you are based in an area or if a particular device doesn't get adequate network reception or a strong signal, your devices will not work optimally. You will have to get a Wind Mobile signal booster for M2M to ensure seamless connectivity and desired speeds. You can choose one of the following types of Wind Mobile signal booster for M2M: Security 4G, Signal 3G and Signal 4G. weBoost Security 4G M2M (471119) Machine To Machine Signal Booster For Security Systems is compatible with 3G and 4G LTE networks. Wind Mobile cellular connections for security systems and panels can get improved 4G data speeds and increased 3G and 4G network coverage. The booster facilitates a direct connection and can be used for alarms, entry systems and any kind of security setup. With reliable network availability and signal strength, this booster allows the devices or security systems to be fail-safe and so they can always send out the alarms or signals as and when necessary. The Security 4G M2M booster makes uploads and downloads faster which include any kind of software upgrades or one-way and two-way communications. Even when there is no communication, the network reception of the device will be improved exponentially by this Wind Mobile signal booster for M2M. With wider coverage and consistent network availability with noticeable fluctuations, security systems can be more reliable. The booster can be easily installed without professional help. There's excellent customer support and it can increase the battery life of systems by up to two hours in areas that have weak signals. 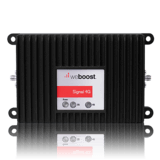 • weBoost Signal 3G (470109) M2M Direct Connect Signal Booster Kit works on the 2G and 3G networks of Wind Mobile. The booster is presently used across Canada, primarily for vending machines and cash dispensers. Like security setups, vending machines and cash dispensers require consistent signal strength to remain operational. Any kind of fluctuation or if the network goes kaput, then the vending machine or cash dispenser will stop functioning and may even halt midway through a transaction. That cannot be afforded by enterprises and would be unacceptable in kiosks or wherever these machines are set up. This Wind Mobile signal booster for M2M offers a max gain of 15 dB which may not sound like much but it is enough to keep a machine operational and the network alive. A noted advantage of this Wind Mobile signal booster for M2M is that it can work at places that have substantial obstruction and thus the network reception as accorded by the nearest cell tower is not much. The Signal 3G booster can easily overcome these obstructions and can work in confined or closed places just as well as it would do outside. • weBoost Signal 3G (470209) Compact M2M Cellular Booster Kit is compatible with 2G and 3G networks. It can be used for ATM machines or cash dispensers and a plethora of other operations. The Wind Mobile signal booster for M2M is a 3G dual band signal booster and the box comes loaded with the cables, repeater, mini antenna and adaptors. It has a two year warranty. The maximum signal strength gain with this booster is 15 dB. • weBoost Signal 3G (470309) M2M Booster With Hardwired Kit is widely used in cash dispensers, vending machines and security equipments among others. Compatible with Wind Mobile 3G, the booster offers two-way amplification and can improve the signal strength by a maximum of 15 dB. The booster also improves the battery life substantially. • weBoost Signal 4G 470119 M2M Signal Booster Kit works with 3G and 4G HSPA+ networks of Wind Mobile. The booster with its bi-directional amplification of signals can improve upload and download speeds, will facilitate seamless correspondences and upgrades of systems or any kind of communication can be much brisker. This Wind Mobile signal booster for M2M is presently used in security systems, vending machines and an array of equipments. The booster comes with a mini antenna that can be easily mounted anywhere that facilitates the maximum enhancement of signal strength. You don't need to drill this antenna. It is magnetically mounted. You may or may not mount the antenna outside. Check the signal strength your device or machine gets usually and then determine if you would want to use the stronger signal available outside or if the signal strength inside is good enough for the antenna to be mounted indoors. This Wind Mobile signal booster for M2M can increase the signal strength by up to 15 dB. • weBoost Signal 4G (470219) M2M Hardwire Signal Booster Kit is compatible with 4G networks. Owing to its reliability and the consistent improvement of signals by up to 15 dB, this Wind Mobile signal booster for M2M is widely used in ATMs, lotto machines and vending machines that require round the clock network availability and a strong signal to operate. While the max gain of signal strength and the coverage may not appear to be a world apart from other signal boosters of its kind, the consistence and the reliability make this device more desirable. It is always better if you can measure the signal strength outside and inside the premises before you choose a Wind Mobile signal booster for M2M. Just check the signal strength in your device over a period of time. Make sure to have a holistic assessment. Don't just check the signal strength at specific times of the day. Check for different times of day and night. Also, observe the fluctuations during heavy use and relatively less intense use to understand the influence of traffic. When you know exactly the kind of network reception your device is being subjected to, you can decide the max gain of signal strength that the device would need to function optimally. Accordingly, choose a Wind Mobile signal booster for M2M. Assess the features of every relevant Wind Mobile signal booster for M2M that would be helpful for the kind of operation you have to attend to and then pick the best one. You wouldn’t invest in a Wind Mobile signal booster for M2M time and again so opt for higher or more advanced features.